As we carry on with our series on slot variances, high variance slots are the final chapter to look more closely at. A high variance slot, as we mentioned in an earlier article, is one that does not often pay, but tends to award large payouts when it does. It is one that tests the focus and determination as players must realise they have to play for longer betweens between wins, and for many, this is difficult if they do not have the appropriate bankroll to “wait it out” so to speak. The majority of slots do not fall under this designation. That is due to the overwhelming majority of players failing to have the patience to wait for the big wins – even though they all hope to hit one! They tend to panic watching their bankrolls slowly reduce and often prefer to play lower or medium variance slots as these pay more often and offer a higher entertainment value. For the few who prefer high variance slots, the waiting for the big win to fall into place generates the highest profit and leads to epic withdrawals. To honour this style of slot, we have compiled a list of the better known high variance slots. These come from some of the top suppliers of slot content online and offer huge win potential that has, over time, become legendary among gambling circles. One thing to remember is that a high variance slot does not mean you have to wager significant ‘per spin’ bets but can wager smaller amounts and achieve wins equal to that amount. As you try those listed below, you will see that even a small bet can reward you with a substantial win, and this is the appeal of a high variance slot. The first two of those we have chosen to look at are the result of the creative minds at NetEnt. NetEnt first graced the net with a focus towards their casinos, however as time went on, that focus came to rest in the creation of gaming content. As they say, the rest is history, as the company has become a leading supplier of sought after slot content. NetEnt’s Dead or Aline is infamous in the world of high variance slots. A simple design, it offers nine paylines, is based in the Wild West and features a number of aspects that place it in this esteemed category. Its paytable features ten payable symbols ranging from 25 to 1000 coins, with its features being wild symbols, multipliers and free spins with sticky wilds. This sounds simple enough, and in essence, it is, however where it achieves its high variance status is its free spin stick wilds. These can fall into multiple positions, award additional free spins and complete multiple five wild paylines. This slot is famous for many of the nets large slot win videos and for a good reason. As a note of interest, those with smaller budgets can enjoy this slot with wagers as low as .09 per spin. The Wishmaster has great potential, let alone graphics and animation. How it achieves the status of high variance is more so in its bonus features, as for the most part, they can fail to achieve great results. Once they do, the results are tremendous, and this is where it counts. The paytable features only eight symbols ranging in five of a kind wins of 50 to 750. It’s free spins are where it holds its magic as multiple bonus features can accompany the free spins and lead to full-screen wilds. Immortal Romance makes the grade more so in relation to its big money features. While it offers a wonderful range of symbols, fourteen in total, and does include a large number of wins, most are smaller in nature. However, it includes four separate free spin features, each offering their own special feature within a feature to help create wins. The big money, however, and where the high variance aspect comes through, it is its Wild Desire feature. This is randomly triggered and can see five reels becoming stacked wilds, and does not trigger often, let alone award wild reel wins of more than one or two reels often. For those with the patience to wait, it can elicit record-breaking wins. Break Da Bank Again is a well documented high variance slot. Many a player has felt the frustration of failing to hit the big wins in this game. Paytable wise, ten symbols are available for symbol win completion and range from a high of 1500 coins to a low of 70. 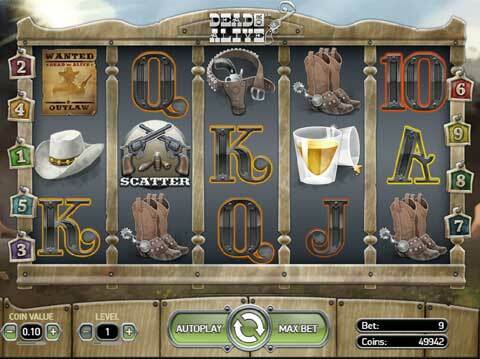 Features include finds a multiplier wild symbol and free spins. The real money comes during the free spins and the multiplier, as any wild joining a win during free spins will be multiplied by 25. However, wins are few and far between due to the potential in size the multiplier offers. A slot well worth playing and with its minimum bet starting at .09, the potential is excellent. Medusa II is the sister slot to Medusa, another popular NextGen slot. The high variance status lies within the fact wins are not as frequent, which is a regular aspect of the higher variance slots. As this slot is designed with a locked reel feature, completing the big wins tends to be harder to accomplish. It’s free spins also feature the locked reels, and as time goes on and you play it, you will find patience is required. As a slot, it offers potential through its random Warrior feature and wild symbol. 300 Shields is one that brings a level of excitement through its potential for massive wins. The reason for this is its multiplier when the free spins are in effect. NextGen did well with its creation and created buzz as a result. One aspect od this slot is the majority of its paytable wins are lower, with those ranging from 100 coins through to 1000 for five Warrior masks, a near impossible combination to realize. However, once its free spins are awarded, a multiplier of up to 300 is possible due to winning additional free spins. Even the smallest of wins, when coupled with a 300x multiplier can result in a substantial win of thousands. Raging Rhino is a legendary slot, both online and in land-based casinos. The nemesis of the game is simple, the rhino and its home in Africa, but it is the wins that it can generate that propels it into legendary status. At first glance, one would look at its paytable and think it is a low variance slot as most pays are low, including its highest. However the money shot comes within the free spins as it couples stacked symbols with multipliers, and those can illicit seriously large wins. This is due to the multiplier multiplying with others when more than one appears. This is one not to miss, regardless of the level of play you are comfortable with. Montezuma is another of the WMS high variance slots. It features many of the right elements that when they come together can reward substantially. The free spin feature is where it holds its greatest high variance element as it includes stacked wilds and a multiplier. When free spins are in motion, additional wins with dedicated multipliers can be triggered, and this results in huge win potential, but also, these can be few and far between, hence its high variance status. Yggdrasil Gaming released this slot a year or so back. It did not take long for it to become a popular game choice for many players as it can lead to extraordinary wins during its free spins. This slot is, for the most part, a copycat of NetEnt’s Dead or Alive. Its paytable, however, has some real allure as the range starts at 100 and advances to a high of 1000 coins. The free spins include sticky wilds and the ability to earn five additional spins should a wild appear on each reel. This is where it achieves its high variance status as this is not a common occurrence, yet, when it does, the wins quickly can add up due to multiple wild paylines. There are few who play online frequently that are unaware of this slot. Play’n Go created a generous game in this slot as it offers the ability to hit stacked symbols on each reel during its free spin feature. As each is paid as a scatter win, the amounts that can be won are huge. The paytable offers a medium variance structure but makes no mistake, this is a high variance slot and is quickly realized once play begins. Stand the test of time, and you will see its value. Those who have fear towards a high variance slot should reconsider their thinking. These are slots that can lead to wins that will rank among the best, and even those with reduced gaming budgets can play with smaller bets and achieve the same results. The reality is playing a combination of medium and high variance can be a solid strategy to employ and should be considered.